Plymouth Citybus and its predecessors have always been a pretty standardised fleet with just a few oddities along the way. 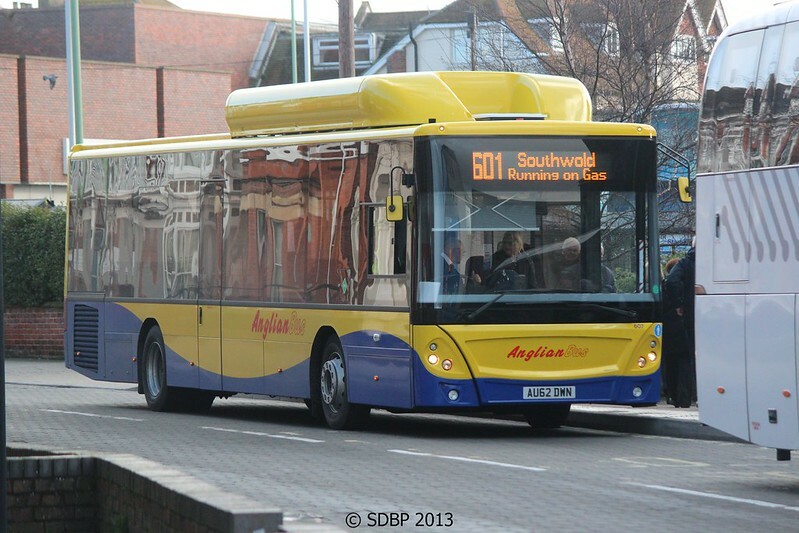 I think its fair to say that the next batch of buses will be among the more unusual to hit the streets of Plymouth. Even twelve months ago, if someone was to tell you that Citybus were to take a batch of fairly new singledeckers from within the Go Ahead Group, you would be unlikely to choose these from the GA Fleet as likely to be heading our way. Well, its almost time, as the gas powered MAN EcoCity 18.270 with Caetano B43F bodywork from Anglian Buses will be arriving in Plymouth next week! The 23rd and 24th should all being well see the buses arriving at Milehouse. They are coming down via Reading where they will be refuelled by Reading Transport. They wont enter service just yet though as they will need to be refurbished and repainted into Flash liveries first. They will certainly make quite an impact on the streets of Plymouth and will also boost the 'green' credential of Plymouth Citybus. Do we know the Flash colour and route yet? Is it still 40/41 as previously suggested? Or another route? Orange Flash for the 43's and Purple Flash for the Eggbuckland service. Another nail in the coffin for Anglian bus i just think soon Go Ahead will close it soon .It has lost too much work . 'Gas flash', of course - goes like a bomb. Actually, I am not sure that 'There in a flash' is the ideal message to put on the side of a gas bus. PCB have missed an opportunity here, they should have saved the green flash livery for the environmentally friendly gas buses. Thanks Graham. That ties up with the 'newer buses soon' on the 4th Sept changes leaflet. Do we know how many buses are coming? At a 15 frequency on the 43 I assume that is 6 or 7 buses. The 27 is half hourly at the moment isn't it, so is that 4 buses and currently links with the 28s. 43 every 12 minutes is six buses. 27/A and 28/A is total of another six buses, so 13 gas buses leaves one spare. I hate these different colour flashes. Makes the fleet look an awful mess. Standard livery looks smarter. They won't have any standard livery left in a minute! I'm not so sure about having a standardised livery as such myself it does give an identity to a certain route.If you think of some of Citybus advert buses then that's another story! !